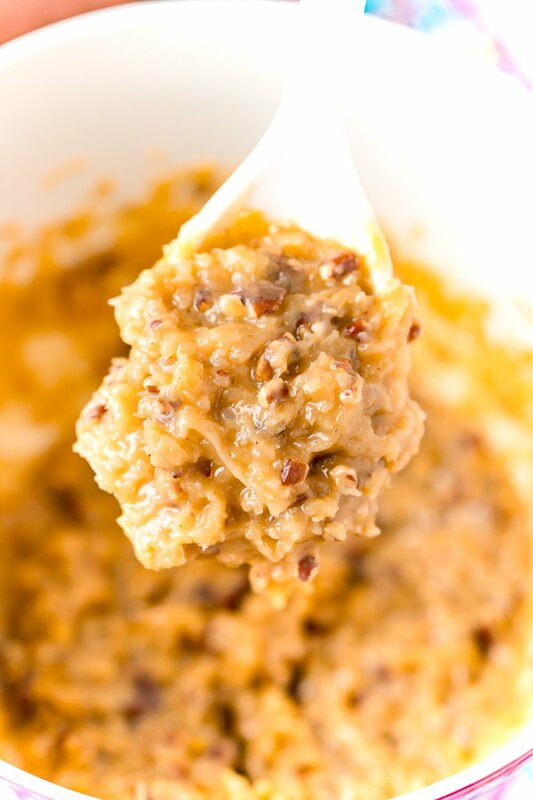 This Coconut Pecan Frosting is a rich and decadent stovetop frosting made with eggs, pecans, butter, sugar, coconut, and evaporated milk used on German Chocolate Cake. 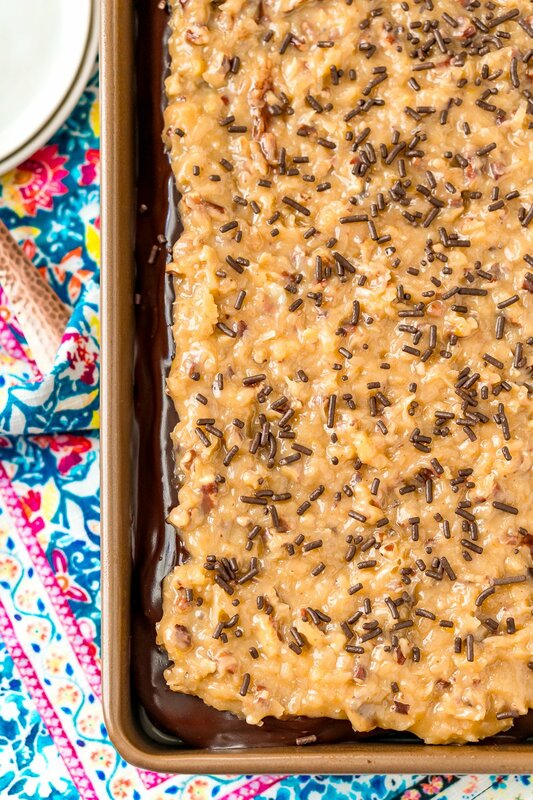 This Coconut Pecan Frosting is the perfect topping for my all-time favorite German Chocolate Cake Recipe. 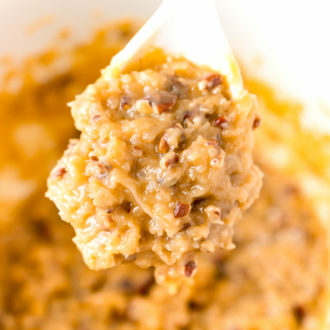 And if you already love this classic dessert, Homemade German Chocolate Cake Frosting will make you love it even more! Also known as Coconut Pecan Frosting, this creamy cake topping can be made right on your stovetop. When you see how easy it is to make, you’ll definitely want to swap it out for the canned stuff! This Coconut Pecan Frosting Recipe is made with evaporated milk, egg yolks, vanilla, chopped pecans, sugar, butter, and shredded coconut. To make the frosting, begin by simply heating the milk, sugar, egg yolks, butter, and vanilla in a saucepan. Cook over medium heat, stirring constantly until the mixture thickens. Remove the mixture from heat and add in the coconut and pecans. Use a hand mixer to beat the frosting until cool and of spreading consistency. 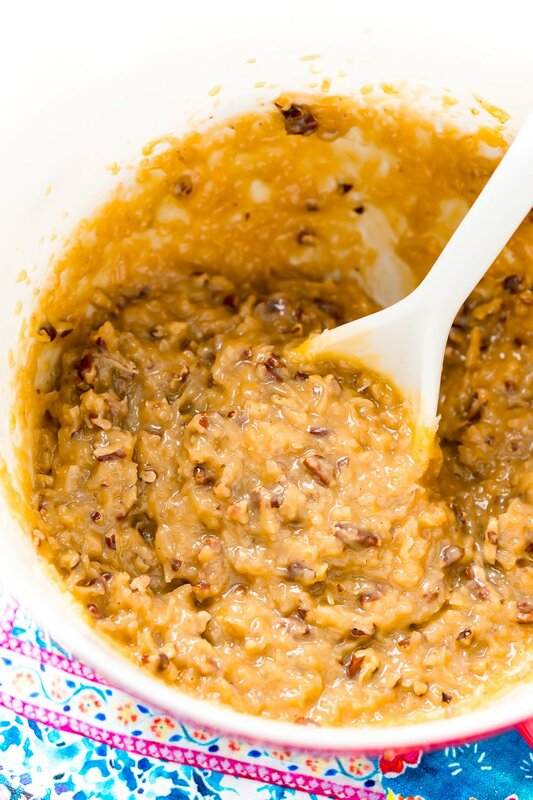 Use as a topping on German Chocolate Cake or another dessert as desired. Coconut Pecan Frosting Is Absolutely Delicious! Coconut Pecan Frosting is so delicious on so many levels. 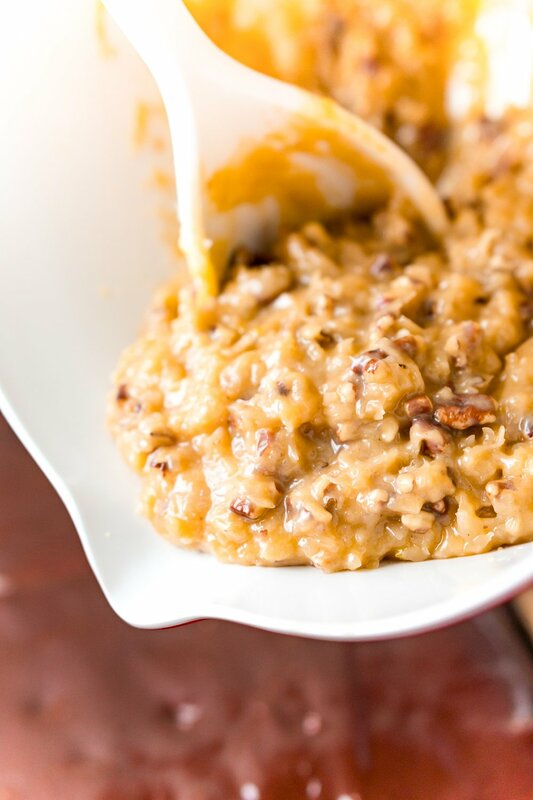 The texture is thick, sticky, and the mix-ins add a bit of craveable crunch. And don’t get me started on the flavors — mellow vanilla, nutty pecans, and sweet coconut are so delicious together. This frosting even has a caramel-y taste that fans of the stuff will really love! Needless to say, this German Chocolate Cake Frosting Recipe and a moist chocolate cake is one heck of a pairing! One of my favorite things about this recipe is that it takes a simple homemade cake up a notch. After all, no one needs to know that this decadent topping is actually easy to make! If you can’t get enough chocolate-coconut-pecan-caramel flavor, there are a few other recipes you have to try! 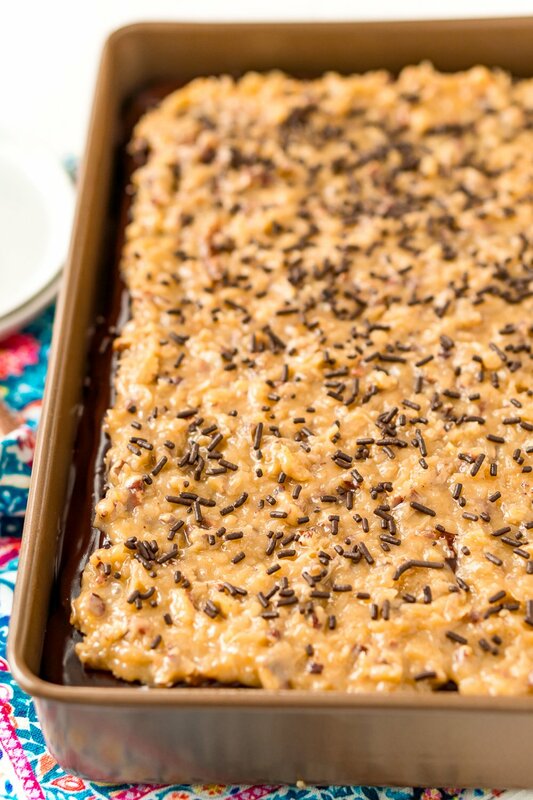 Whip up a German Chocolate Cake for parties, and a batch of German Chocolate Cocktails for girl’s night! But when it comes to birthdays, holidays, or dinner parties, a layered German Chocolate Cake really … well, takes the cake! Looking for a dessert that’s sure to impress? 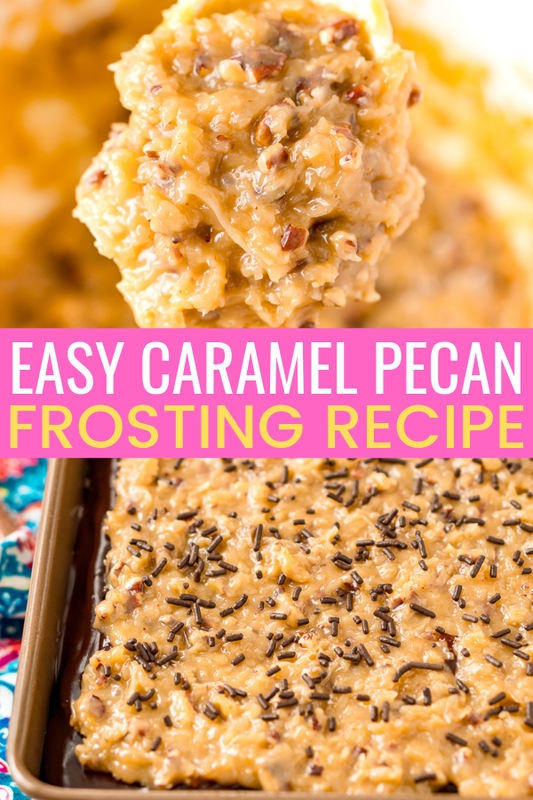 Make a German chocolate cake with this Caramel Pecan Frosting Recipe, and everyone will be begging for a slice! Combine the evaporated milk, sugar, egg yolks, butter, vanilla, and salt in a saucepan. Cook over medium heat, stirring constantly until mixture thickens, about 12 minutes. Remove from heat. Add the shredded coconut and chopped pecans to the mixture and beat with a hand mixer until cool and of spreading consistency. Makes about 2 1/2 cups or enough to cover tops of three layers.